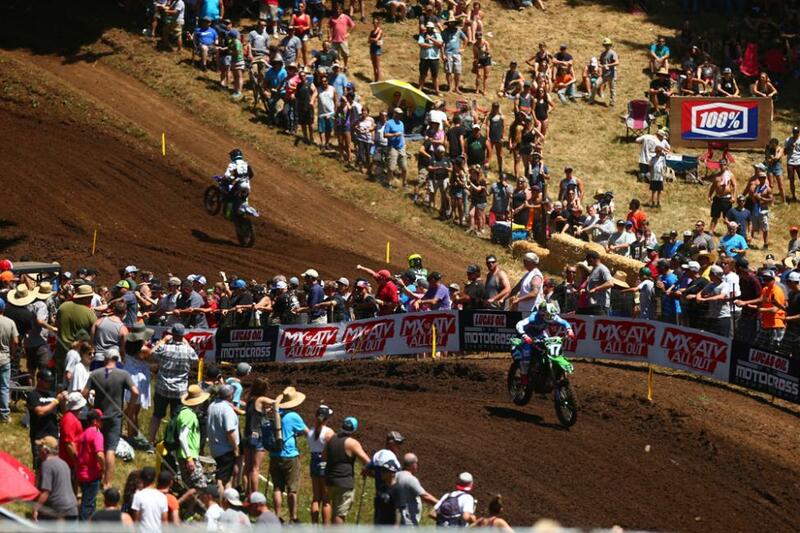 The Lucas Oil Pro Motocross Championship, sanctioned by AMA Pro Racing, made its lone visit to the Pacific Northwest for the ninth round of the 2018 season, with the 38th running of the Motosport.com Washougal National from Washougal MX Park. In the 450 Class, Monster Energy Kawasaki’s Eli Tomac put forth another impressive ride to sweep the motos and grab back-to-back victories. In the 250 Class, a wild afternoon of racing saw consistency help Monster Energy/Yamalube/Star/Yamaha’s Aaron Plessinger emerge with his third straight win to open a commanding lead in the championship. The first 450 Class moto got underway with Autotrader/Yoshimura/Suzuki Factory Racing’s Justin Bogle grabbing the Motosport.com Holeshot over his teammate Justin Hill. Behind them the Monster Energy Kawasaki tandem of Josh Grant and Eli Tomac battled for third, with Tomac taking the position. Hill immediately pressured Bogle for the lead while Tomac gave chase, while Team Red Bull KTM Factory Racing’s Marvin Musquin moved into fourth. Bogle was able to withstand the early threat from his teammate, which allowed Tomac to make the pass for second. Hill was then forced to deal with Musquin in a battle for third. 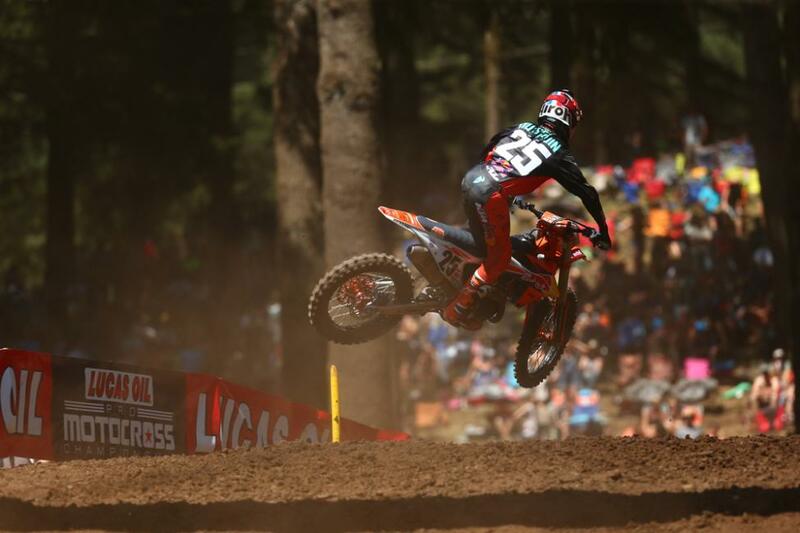 It didn’t take long for Musquin to break into podium position and drop Hill to fourth. Out front, Tomac’s relentless pursuit of the lead paid off as he passed Bogle for the top spot and proceeded to quickly open a gap. A short time later Musquin found his way around Bogle for second. With a clear track Tomac was able to pull out to a three-second lead after just one lap. With the lead duo distancing themselves from the field, the battle for third intensified. Hill was finally able to get by Bogle to take over third, and soon after that Team Honda HRC’s Ken Roczen moved into fourth. Hill briefly held off the former champ for the final podium spot, but Roczen worked his way around to seize control of third. Tomac was in a class of his own out front and continued to build on his lead throughout the remainder of the moto. He took the checkered flag 11.6 seconds over Musquin, who went unchallenged for second. 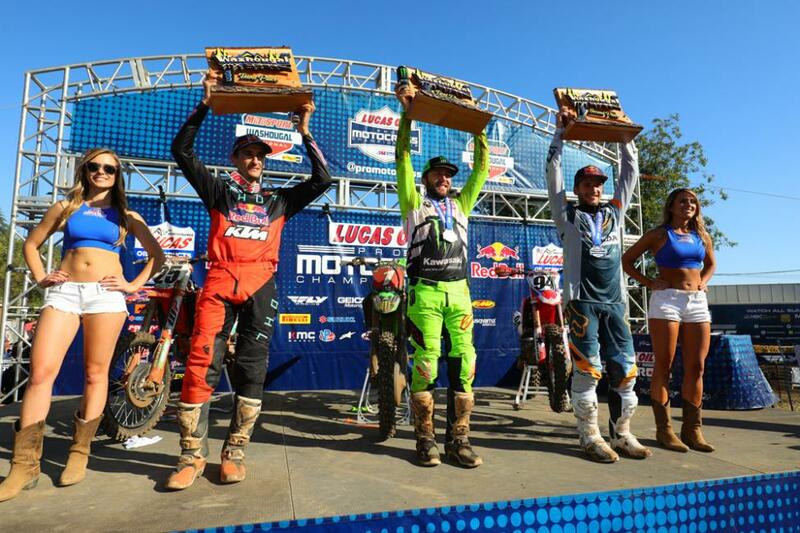 Roczen rode to an uneventful third-place finish, while Hill equaled his career-best result in fourth. Monster Energy/Yamaha Factory Racing’s Justin Barcia overcame a tip over on the opening lap to make a late pass for fifth. The final 450 Class moto saw Bogle sweep Motosport.com Holeshots, but he was soon overtaken by Roczen, who wasted little time in sprinting to a lead. Hill got another strong start in third, followed by RMATV/MC-WPS-KTM’s Blake Baggett and Musquin. Tomac started deep inside the top 10. The field jockeyed for position throughout the opening laps, with Hill getting around Bogle for second and Musquin around Baggett for fourth. The Frenchman then chased down and passed Bogle for third. Roczen sat more than two seconds ahead of the field after the first full lap of the moto, and continued to push the pace in hopes of building a lead he could manage for the long haul. Behind him Tomac was picking up the pace as well and moved up from eighth to fifth. In an effort to catch Roczen, Musquin engaged in a heated battle with Hill for second and their back-and-forth worked to the benefit of Roczen, who moved out to an advantage of more than three seconds once Musquin finally got by Hill for second. Not long after that Tomac gained another spot as well, getting aggressive with Barcia to take over fourth. All this action took place within the first 10 minutes of the 30-minute-plus-two-laps moto. Drama unfolded just before the halfway point of the moto as Hill crashed out of third, giving the spot to Tomac. However, Tomac went down a short time later as he looked to track down Musquin. 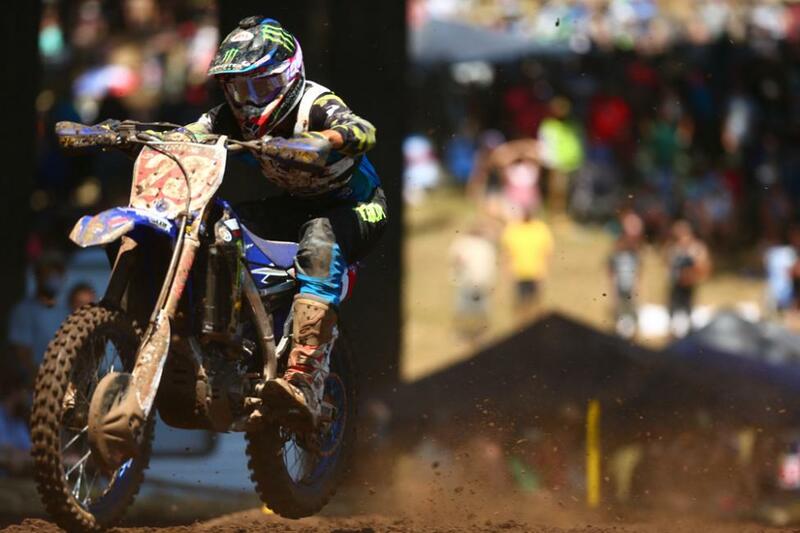 The point leader gave up third to Barcia, but remounted quickly in front of Baggett to hold on to fourth. Tomac then went back to work to try and catch Barcia. He successfully did so and retook the position with 13 minutes to go. The pass put Tomac into a tie with Roczen for first in the overall classification, but the second moto tiebreaker weighed in the German’s favor. Tomac would need to erase an 11-second deficit on Musquin in order to take sole possession of first. Roczen did what he had to do out front and continued to lay down the fastest laps on the track to build on his advantage over Musquin, but Tomac was on a mission in third. He posted the fastest times of the moto over back-to-back laps to take massive chunks out of Musquin’s advantage. His pace was multiple seconds faster than both riders ahead of him and soon enough Musquin was in his sights. Tomac wasted little time in applying pressure on his rival, but Musquin put up an impressive fight to hold him off. It was only a matter of time, however, and with four minutes to go Tomac took over second, and with it the overall win. However, he wasn’t finished. With three laps to go less than two seconds separated Roczen and Tomac, and the defending champion made an attempt for the lead with a dive bomb down the track’s big hill. Roczen held him at bay, but just briefly. Tomac surged past Roczen as they took the two-lap board and immediately pulled away. He carried on to sweep the motos by 2.2 seconds over Roczen. Musquin followed in third. Tomac has moved out to a 15-point lead over Musquin in the 450 Class standings with three rounds remaining. Roczen moved into a tie with Barcia, who finished fourth, for third. They sit 71 points behind Tomac. The opening 250 Class moto saw Monster Energy/Pro Circuit/Kawasaki teammates Joey Savatgy and Austin Forkner grab the early advantage, with Savatgy claiming the Motosport.com Holeshot. Behind them, Troy Lee Designs/Red Bull/KTM’s Jordon Smith slotted into third, while Plessinger started just outside the top five. After a torrid opening lap the field settled in, with Savatgy stabilizing a small gap on Forkner as Plessinger fought his way up to fourth and soon gave chase to Smith for third. The top four started to distance themselves from the rest of the field and sat within two seconds of one another for several laps. Savatgy was able to open a gap, but Forkner fought back and was able to make an aggressive pass for the lead with just under 17 minutes remaining in the 30-minutes-plus-two-laps moto. The gap between the lead group ebbed and flowed, but Forkner upped his pace to stabilize a lead of just over a second on Savatgy. With less than five minutes remaining the teammates found themselves within a bike length of one another as Savatgy mounted a late challenge. The Kawasaki duo was able to pull away from Smith, which set the stage for a head-to-head battle for the win. With two minutes to go Savatgy made it happen with an aggressive pass of his own to reclaim the lead. Forkner didn’t let up and fought back, but Savatgy fended him off. As they continued to fight, Smith closed back in from third. A few small bobbles by Forkner gave Savatgy the advantage he needed to race to his first moto win of the season by 1.9 seconds. Smith was third, with Plessinger fourth and GEICO Honda’s Chase Sexton fifth. The deciding 250 Class moto saw Plessinger emerge with the Motosport.com Holeshot over Troy Lee Designs/Red Bull/KTM’s Shane McElrath, who made a run around Plessinger to seize the lead. Forkner slotted in third while Savatgy was mired deep in the field in 25th after going down. Forkner’s day came to an end on the first lap when he crashed while running third and was forced out of the moto. That gave third place to Monster Energy/Yamalube/Star/Yamaha’s Dylan Ferrandis. With a clear track McElrath was able to put the hammer down and sprint out to a lead of more than three seconds on Plessinger mere minutes into the moto. As the leaders settled into their positions all eyes turned to Savatgy, who was going all out in an effort to salvage a spot on the overall podium, if not the overall win. The Kawasaki rider made aggressive moves through the field and was on the verge of top 10 just past the halfway point of the moto. McElrath successfully managed a lead of about five seconds over Plessinger, but the point leader made a costly mistake by going down and dropping a spot to third behind Ferrandis. 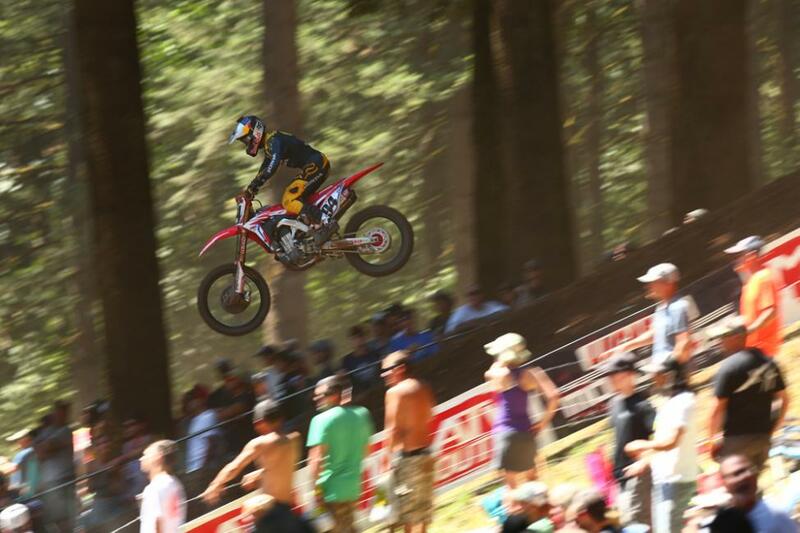 That gave McElrath a commanding 12-second lead over the field that he would not give up. McElrath cruised to the first moto win of his career, crossing the line 12.7 seconds ahead of Ferrandis, with Plessinger third. Savatgy left it all on the track with a ninth-place finish. When the overall results were tallied, Plessinger’s 4-3 finishes just barely clinched his third straight victory by a single point over McElrath (9-1) and Savatgy (1-9), who finished in a tie for second with the tiebreaker going to McElrath by virtue of his better result in the second moto. The win added 10 points to Plessinger’s lead in the 250 Class standings, which now stands at a comfortable 59 points over Troy Lee Designs/Red Bull/KTM’s Alex Martin, who finished sixth. More than a full race worth of points now sits between the top two with three rounds remaining. 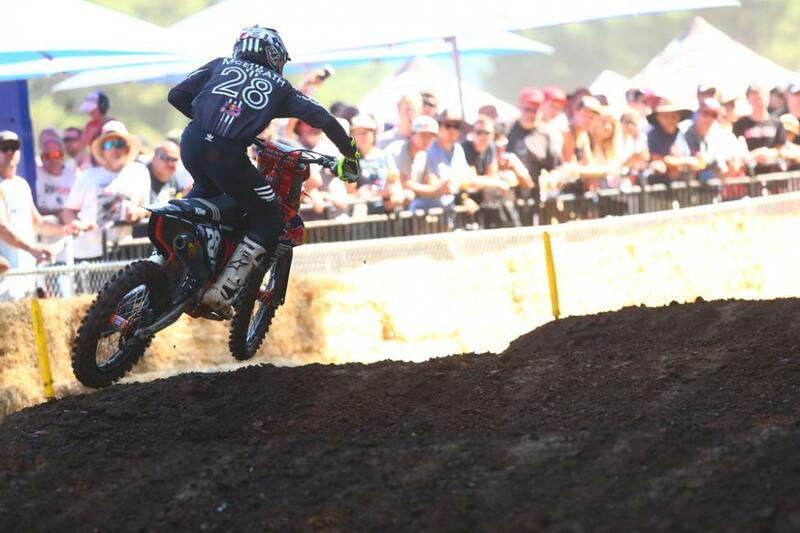 The 2018 Lucas Oil Pro Motocross Championship will take its final break of the season before returning to action on Saturday, August 11, with its annual visit to famed Unadilla MX in upstate New York for the Massey Ferguson Unadilla National. First motos of the 10th round can be seen live on MAVTV at 10 a.m. PT / 1 p.m. ET. The second 450 Class moto will air live on NBC broadcast network at 12 p.m. PT / 3 p.m. 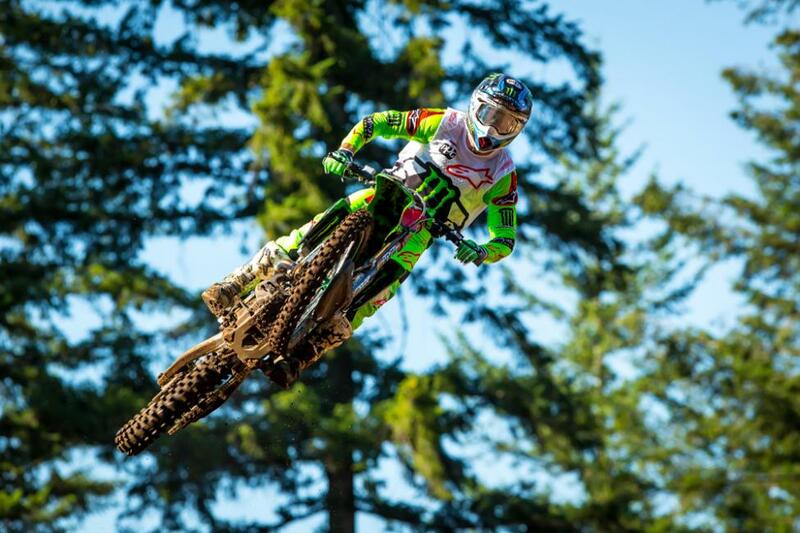 ET, while the final 250 Class moto can be seen via tape delay on NBC Sports Network at 4:30 p.m. PT / 7:30 p.m. ET. Additionally, all of the action can be seen as it unfolds online via the “Pro Motocross Pass” on NBC Sports Gold.